Materials Yass Black and Wombeyan marbles, in a stainless steel frame. 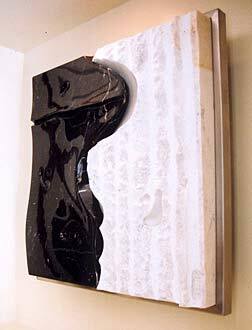 This sculpture is a bas-relief in marble. Its concept is a depiction of a journey through a landscape with waterholes. It is a picture of a long term relationship, with its drama, quiet bits and intimacy.